Chevrolet Gm iPod/iPhone adapter interface for factory stereos this integration kits will allow you to connect your iPod/iPhone to your factory radio. The interface plugs into the back of the GM radio and will be control using the XM radio controls. Radio needs to be XM ready with a Band button or CAT button full iPod or iPhone controls from the Oem radio you can also add other Mp3 player, Smartphones, using the second aux input port or it can be use with the optional Bluetooth or HD Radio. 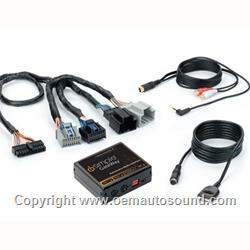 The Isimple gateway seamlessly connects your Chevrolet factory stereo with you iPod or iPhone. You'll enjoy crystal clear audio, track and playlist browsing through you standard radio controls, and battery charging on your iPod or iPhone .Plus, the Isimple gateway offers an extra input for use with other portable audio devices, or it can be upgraded for HD radio. This interface is not universal or an FM transmitter. Charges all iPods iPhones 12 volts firewire and 5 volts USB.